Croakey - Online - What does it take to stop people with dementia being given too much medicine? Health experts say antipsychotics continue to be used at worrying rates to manage behaviour of people with dementia in Australia, despite evidence they can cause significant harm and that non-pharmacological responses work well. A Choosing Wisely Australia meeting in Melbourne recently heard of a “simple and low cost” technique being promoted to GPs, pharmacists and aged care facilities to improve patient care and cut such risky medication use. It involves simply asking carers and family for their top tips on what might help to calm patients when they are distressed or agitated – and then making sure that information is shared formally across care teams – rather than opting for a pharmacological remedy “as a first choice”. Journalist Marie McInerney reports below on the TOP 5 and Veterans’ MATES programs, as well as insights being offered by Residential Medication Management Reviews on patterns of medication use – including statins and anti-psychotics – in the Australian aged care sector. McInerney attended the meeting for the Croakey Conference News Service. Marie McInerney writes: ‘Jim’ was a patient with dementia at an aged care facility who would become very anxious whenever he heard a call bell rung from the nursing station.vIt turned out that he had worked as an ambulance officer and the bells made him feel he had to jump into action for an emergency. His family told staff to speak to him when he got distressed by the bells as if he was a member of the care team, using professional terminology and letting him know that “another car is responding”. “He settled well and trusted us,” came the feedback to an evaluation published in 2014 by the New South Wales Clinical Excellence Commission (CEC). The TOP 5: Improving the care of patients with dementia 2012-13 report evaluated the implementation and impact of the TOP 5 project developed by the state’s Central Coast Local Health District across 17 public and four private hospitals during 2012 and 2013. The project encourages health professionals to talk to carers and families, asking them to share five tips on ways to improve care and allay distress for a patient with dementia. The tips are then used by the hospital team to develop a strategy to better manage patient care, in a process that the CEC says takes about 20 minutes to implement for each patient. It generated tips that are not just heart-wrenching in their simplicity, but powerful tools for addressing inappropriate use of antipsychotic medicines that are associated for older patients with a number of serious adverse events, ranging from falls and risks of hip fractures to pneumonia, stroke and death. Bob’s case was another example documented in the CEC report of addressing distress or agitation by better personal care. Admitted to an aged care facility without a primary carer, he would get very agitated each day at 4.30am and was very difficult to settle. One day a visitor recognised him and told staff that he used to manage a delivery yard and part of his job was to get the trucks on the road by 4.30am each day. “Just say ‘Bob, the trucks are all gone’, and he will settle,” was the advice. Another case concerned physical comfort for an 82-year-old man whose wife had been his carer. He had had polio as a child and wore a splint on his left leg when walking, but it got very cold and painful and would stop him from sleeping. She told staff they should wrap up his left foot to keep it warm when he was in bed. Staff reported that he would then settle down and sleep. The CEC study, led by Patient Based Care Director Dr Karen Luxford, found that TOP 5 led to improvements in patient outcomes, safety, carer experience and staff satisfaction, along with potential cost savings and, critically, evidence of a lower rate of anti-psychotics use. Almost 100 per cent of carers in the study reported high satisfaction with the way staff had used the TOP 5 strategies, 85 per cent agreed TOP 5 had benefited the patient and 82 per cent said the patient was calmer. “What we found when we talked to (health professionals) was that of course they spend time talking to families and carers, but often that information gets lost at handovers or isn’t passed on or they see how families get frustrated at having to go over the same information again and again,” Luxford told Croakey. 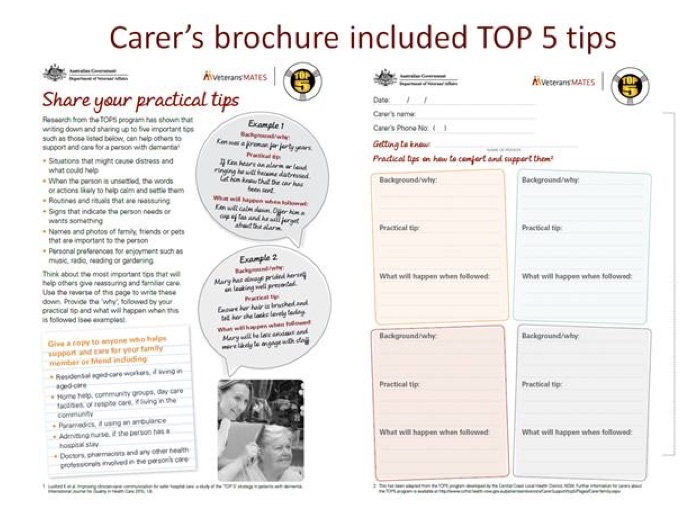 Now the TOP 5 approach has informed recent work by the Veterans’ MATES (Medicines Advice and Therapeutics Education Services) to encourage GPs, pharmacists and aged care facilities to use similar tips for personalising care for patients with dementia. In August 2015, the Therapeutic Goods Administration (TGA) tightened guidelines on the use of the antipsychotic risperidone for patients with dementia due to an increased risk of cerebrovascular adverse events. Choosing Wisely says there remains concern that antipsychotics and similar medicines are being overprescribed to people with dementia “first line as a means of behaviour control”. “Do not use antipsychotics as the first choice to treat behavioural and psychological symptoms of dementia.” – from the Australian and New Zealand Society for Geriatric Medicine. “Don’t initiate and continue antipsychotic medicines for behavioural and psychological symptoms of dementia for more than three months.” – from the Society of Hospital Pharmacists of Australia. Even an initial scan of prescribing data reveals that antipsychotic drugs are “widespread” in aged care, according to Dr Chris Alderman from the privately run Ward Medication Management (WWM). Alderman told the Choosing Wisely meeting that the complex data generated from the multiple Residential Medication Management Reviews (RMMRs) that it conducts each month offers a rich resource for detecting patterns of medication use in Australian aged care. Funded under the Medicare Benefits Scheme, RMMRs aim to identify, resolve and prevent medication-related problems in government-funded aged care facilities. The reviews are conducted by an accredited pharmacist when requested by a resident’s GP and done in collaboration with the resident’s GP and appropriate members of the resident’s healthcare team. They can be prompted, Alderman said, by a range of reasons such as a new admission or routine two yearly check, hospitalisation after a fall, a new geriatric symptom, or an adverse drug reaction. He said that of nearly 25,000 reviews currently in the company’s database, a diagnosis of some form of dementia was documented in more than 5,000 cases. Of the 6,300 cases (25 per cent) where antipsychotics were prescribed for residents, 4,270 did not have any recorded documentation of dementia, much less for psychosis, he said. “There is clearly widespread use of antipsychotic agents amongst older people in aged care who do not have documentation of dementia or psychosis,” he said. The Veterans MATES program is funded by the Department of Veterans Affairs to improve medicine use in the veteran community. Its ‘Dementia and changes in behaviour’ program was launched to highlight the TGA changes on antipsychotic medications and the potential for using non-pharmocological strategies as “first line treatment for behaviours of concern”, said Natalie Blacker, Development Coordinator for Veterans’ MATES and based at the University of South Australia. “We’ve seen about one quarter of residents in Australian aged care facilities are dispensed a regular anti-psychotic and we’ve seen similar rates in the veteran population,” Blacker told the Choosing Wisely meeting. In August last year Veterans’ MATES distributed information, including an adapted Top 5 ‘prompt’ (SLIDE below), to a targeted group of 5,000 GPs and 8,000 pharmacists, plus all 2,500 of Australia’s residential aged care facilities, as well as a one-page evaluation survey. The survey prompted a small but “reasonable” response (7 per cent of GPs, 8 per cent of aged care facilities, 4 per cent pharmacies) and promising indications for improved care, Blacker said. Over 90 per cent of respondents indicated they were likely to assist family member and carers of their patients with dementia to identify their tips and 75 per cent of the aged care facilities were keen to put them to use as part of care plans in aged care. Although the majority of GPs said they were unsure whether patients had become less agitated or stressed as a result of the TOP 5 tips, one third said they had, she said. Further detail won’t be available until the project’s full evaluation is complete, but Blacker said initial data suggest there has been a reduction in dispensing of since both TGA and Veterans’ MATES interventions (see slide below: the first (yellow) intersecting line marks the TGA change and the second (maroon) line is the Veterans’ MATES intervention. Blacker said the intervention demonstrates that encouraging family members and carers to identify their tips was well received by both carers and health professions, and the majority of health professionals indicated they were likely to “encourage use of this simple and low cost strategy”. For more information: The NSW Clinical Excellence Commission has published a second report on the use of TOP 5, looking at transitions of care between hospital, residential aged care facilities and community services. It again found that TOP 5 is a valuable communication strategy that can be used during transitions of care to improve patient safety, staff and carer satisfaction.